Initially I must admit to having had mixed feelings about this. 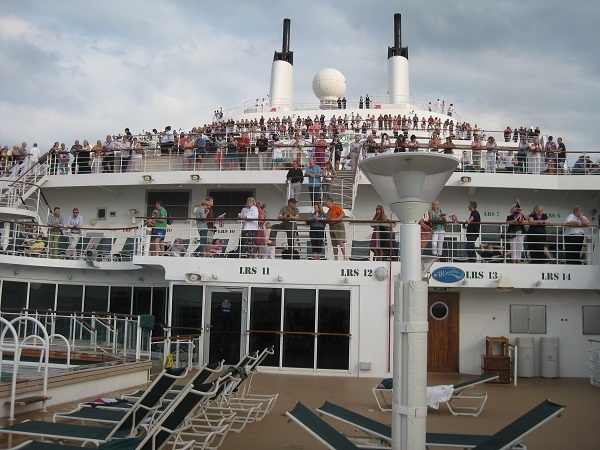 Were we really the sort of people who went on cruises? Would we spend the whole week trapped by dreadful companions? Would we be the only passengers under 70? 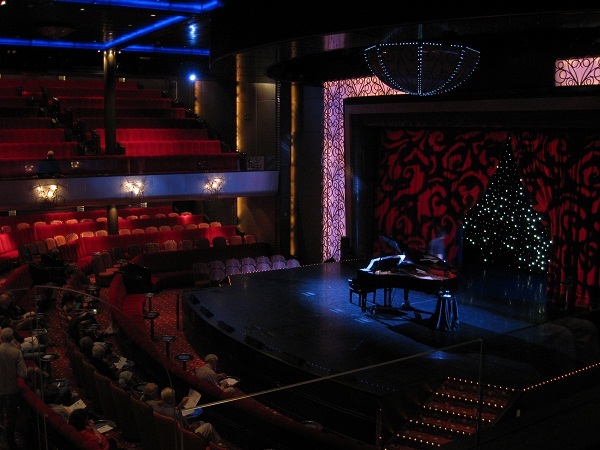 Would we get bored, or seasick? Ultimately the die was cast by the economics of the journey – we booked reasonably late on, by which point the cost of the voyage was less than a single air fare, and had the added bonus that we could take all our luggage with us (some 16 bags and cases of varying dimensions) at no additional cost. Another plus was that the length of the voyage meant that the time difference was accounted for gradually, so on 5 of the 7 nights we gained an extra hour (which we didn’t always spend in the bar!). 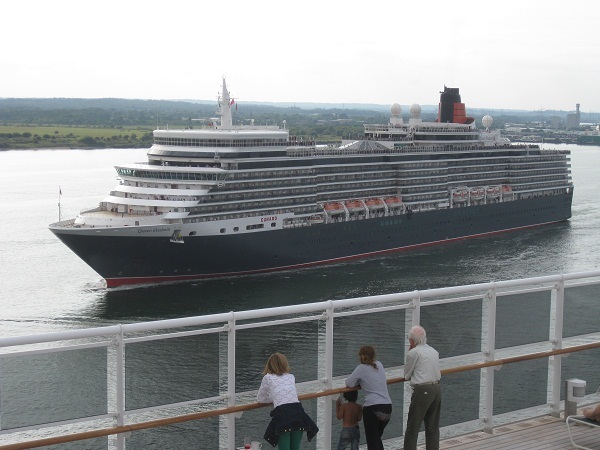 Our first glimpse of the vessel at Southampton docks was most exciting – a true ocean-going ship, the QM2 is enormous but beautifully designed and quite spectacular to behold. The boarding process was a little less glamorous – porters spirited our luggage away (thankfully) as we joined a lengthy queue in what looked like an aircraft hangar – but the staff were very efficient and we didn’t have to wait too long. We were pleasantly surprised by how diverse our fellow passengers were – a contingent of wealthy-looking senior citizens to be sure, but plenty of younger couples and a significant number of families too. We learnt during the week that some 34 nationalities were represented amongst the passengers (around 54 amongst the crew), and that there were just over 300 children (& 10 dogs!). 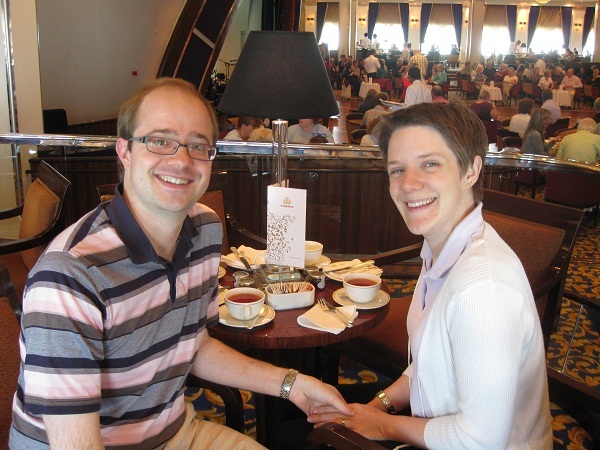 Upon boarding the ship we found ourselves in the foyer of what looked like a very upmarket hotel, with glass lifts, elaborate flower arrangements, stupendous wall decorations and a champagne bar. Exploring further we discovered just how well-equipped she is, with a theatre, planetarium, art gallery, spa, gym, library, nightclub, ballroom, 4 swimming pools, a handful of shops, several restaurants and numerous bars. Just before leaving we were treated to the sight of the QM2’s sister ship, the Queen Elizabeth, as she preceeded us out of the harbour, with much blasting of EXTREMELY loud horns as she passed (we were up on the topmost deck at that point, and the view was almost worth the pain on the eardrums). 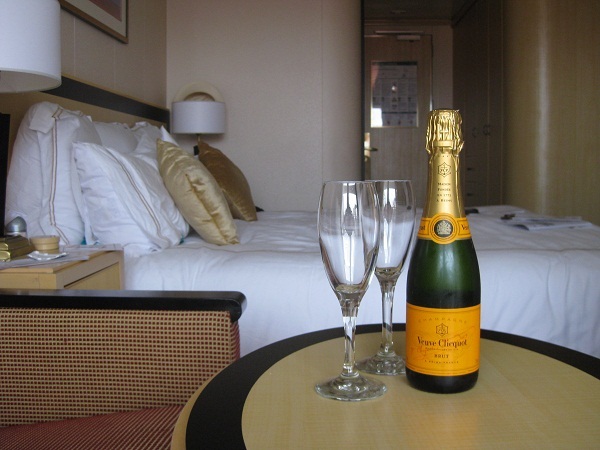 For our own departure we managed to get a good spot on the aft deck, and enjoyed a glass of champagne as we steamed down Southampton water. Various stirring tunes were played over the PA system (the Alleluia chorus, fireworks music, that sort of thing), and Union flags were provided to those who felt the need to wave one, making the whole thing feel rather like a nautical last night of the Proms. 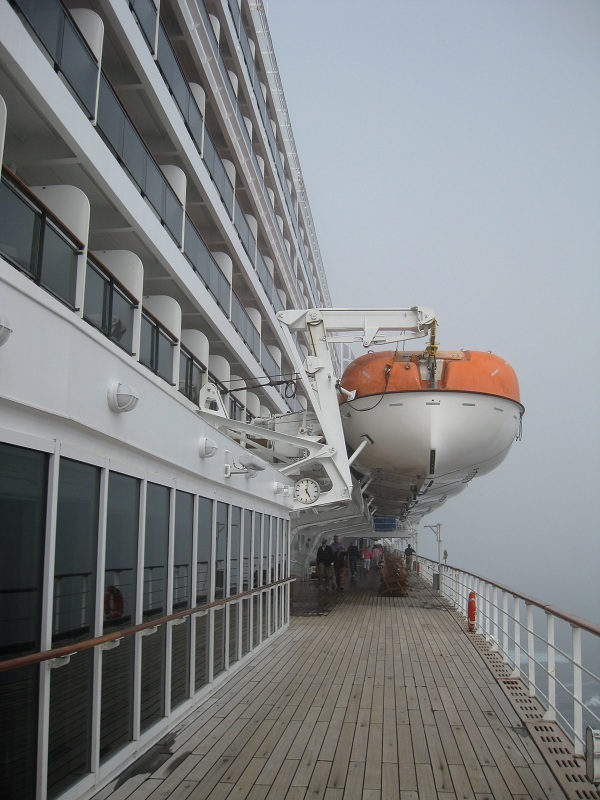 We were extremely lucky with the weather – seas remained calm for the whole crossing (apparently it’s wrong to call it a cruise as the ship doesn’t make port anywhere along the way), and we had a mixture of sunshine, showers and fog, so were able to exercise by walking laps of the promenade deck most days. Our cabin was extremely comfortable, and we appreciated having our own balcony. It gets rather windy when steaming across the Atlantic at around 19 knots – the average wind speed on deck was around 35 knots – so we didn’t sit out much, but having lots of natural light and a little bit of a sea view was lovely. Each evening we received a newsletter with details of the following day’s events programme, and there was never any risk of boredom with masses of activities to choose from. We watched fruit carving and cookery demonstrations; attended several concerts; listened to lectures about the construction of early New York skyscrapers, the conservation of the Statue of Liberty, the gemstone zultanite and limited edition print making; went on a tour of one of the main kitchens (or galleys); drank champagne in the art gallery; went swimming; took a class in waltzing; enjoyed a show in the planetarium, a murder mystery play and a q&a session with the Captain. On top of all that we were regular visitors to the library, not to mention several of the bars and restaurants. Despite a fairly action-packed week, by the end we were certainly well-rested (as well as several pounds heavier) having had a fantastic time, and were rather sorry to have to leave. This entry was posted in Travel and tagged cocktails, Cunard, Queen Mary 2, travel by Emma Davidson. Bookmark the permalink. 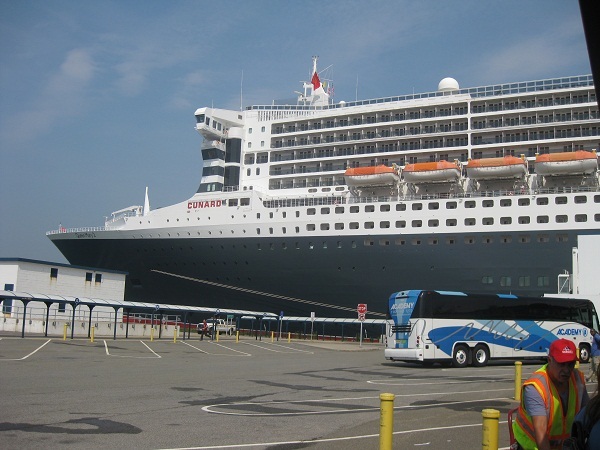 Have been lucky enough to be on two transatlantic crossings and I have to say that QM2 is THE only way to travel to the USA. We were on board for the 4 day mini cruise straight after the re fit last year and she is looking even more wonderful. Cant wait to be back on board for a winter cruise to the Canaries in November – 87 days to go (at the time of writing this) – do you get the impression that I cant wait to be back on board? Superb way to get to New York if you don’t like flying, and all that baggage!